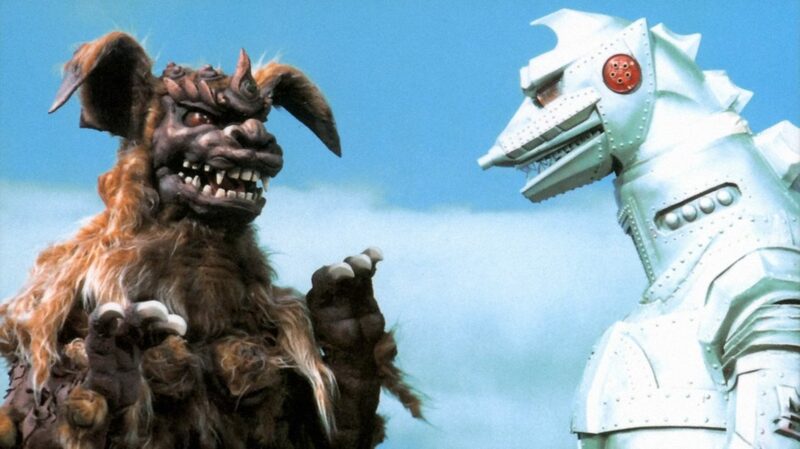 Godzilla vs. Mechagodzilla, from 1974, was among the first Godzilla pictures I ever saw, so I was never till now in a position to appreciate what a massive shift in the series it represented. In particular, what a jaw-dropping change it meant for director Fukuda Jun, whose four preceding Godzilla projects had all been largely frothy, juvenile affairs with far too much emphasis on James Bond-style thriller mechanics. The optimist in my likes to suppose that the kid-friendly tack of the Godzilla films was starting to lose favor at Toho, with the immediate prior film, Godzilla vs. Megalon, selling fewer tickets than any other entry in the franchise's history, and the '70s Godzilla flicks having in general significantly underperformed. And by all means, Godzilla vs. Mechagodzilla sent the franchise at least temporarily in the right direction financially, out-performing every film in the series since Destroy All Monsters. But it is not, I must confess, entirely because the film is meaningfully more "serious" than anything else in the franchise. Indeed, it is downright goofy in many ways; the difference is that Fukuda isn't treating the goofiness as trivial, but framing it for the first time with some kind of integrity and care. And thus it is that even as we have yet another damn movie about Godzilla fighting off an alien invasion and gadgets and mysterious figures in sunglasses, all of them matinee tosh at is most clichéd, Godzilla vs. Mechagodzilla still feels rather more legitimate than something like the giddy, idiotic, pointless Godzilla vs. Gigan. If not for the abysmally carnivalesque score by Sato Masaru, it wouldn't be at all hard to mistake this for a lower-tier effort by Hondo Ishirō. The film's plot is a bit ditzy all around, but it gets to the good stuff quickly. Strange things are afoot in Okinawa - the first Godzilla film to take place in that region - with Princess Nami (Lin Beru-Bera) of the Azumi people having a vision of great destruction at the hands of a monster, just around the time that archaeologist Shimizu Keisuke (Daimon Masaaki) uncovers a subterranean chamber full of artificacts and murals referring to an ancient prophecy, also of great destruction at the hands of a monster. And also at the same time, Keisuke's brother Masahiko (Aoyama Kazuya) finds a shard of inexplicable metal that cannot be identified by his go-to expert, Professor Miyajima (Hirata Akihiko). And just when the number of subplots and characters starts to get complicated - I have mentioned neither Azumi priest Kunito Tengan (Imafuku Masao) nor prophecy-expert grad student Kanagusuku Saeko (Tajima Reiko), both of whom play significant roles - the prophecy bears fruit, when Mount Fuji erupts back on Honshu, and most of our principals are onhand to witness Godzilla coming forth to be wicked and evil for the first time in quite a while. And not just Godzilla - Anguirus pops up too, and seems just as perplexed by the giant lizard's newfound villainy, for the two former allies set to battling. Anguirus gets much the worst of the fight - Godzilla rips his jaw open, in a truly discomfiting display of blood for a '70s Godzilla picture - and manages to lay in just enough blows to reveal something metallic beneath Godzilla's skin. That's all we need to go on who've read the film's title, but it will be a while yet before this wicked Godzilla with the wrong-colored flame breath and the tinny roar comes into contact with the real Godzilla, who pummels it hard enough that its controllers punch a button that causes its synthetic flesh to melt away, revealing a Godzilla-shaped machine, the one and only Mechagodzilla. Mechagodzilla wins pretty handily, leaving Godzilla to nurse his wounds and the humans to wonder what the hell is happening. Which is, for the record, that Mechagodzilla is an alien weapon created by the inhabitants of the third planet of the black hole (the precise meaning of that phrase is left as an exercise for the viewer, hopefully one with an exceptional illiteracy concerning astrophysics), currently hoping to take over the world, as alien races do. This threat is too much for the King of the Monsters to take on alone, but luckily, the Azumi prophecy has an answer: the humans just have to raise the guardian spirit King Shisa (not King Caesar, a common romanisation based in straight-up cultural ignorance at the time of the film's debut), and he and Godzilla will combine their forces to stop the invasion. Unfortunately, raising King Shisa is no cakewalk itself, especially with an alien agent (Kusano Daigo) trying to steal the statue that's key to unlocking the god. There's a lot of plot involved, and most of it is unabashedly stupid, but does it ever move! I suppose that in theory, one could become bored with Godzilla vs. Mechagodzilla, for it is a bit flight and aimless, but the sheer variety of events and tones throughout the film would make that rather difficult. The biggest problem with it is that the early promise of lots of monster action - the Anguiras-Mechagodzilla fight happens surprisingly fast, and the Godzilla-Mechagodzilla fight not very long at after that - there's a long void during which we have only the human plot to carry us forward; and this is of course rarely a good thing in a daikaiju eiga. Godzilla vs. Mechagodzilla has the decency to be strange and kinetic in a straight-faced way that makes its loopiest developments - such as the reveal that the aliens are space gorillas with the ability to change themselves to look like humans - treated with a kind of horror-tinged sincerity that sets the film a solid step away from the cinematic junk food that the series had become. What primarily sets the film apart, though, is the monster action, which is better here than it had been since Tsuburaya Eiji had stepped down. Effects director Nakano Teruyoshi isn't entirely able to disguise the small size of his budget - the wires used whenever one monster throws another through the air are embarrassingly visible - but the creativity of the fighting itself is high enough to compensate for the sometimes patchy work, and the rough-looking Godzilla that has been redressed but only marginally improved from the horrible-looking suit introduced in Godzilla vs. Megalon>. King Shisa is a well-realised version of what he is, though I'll confess that what he is looks a bit too carpet-ey for my tastes. There's a lot to love, though: the dramatic scene of Godzilla absorbing lightning; the shameless kitschiness of the scene where he subsequently turns himself into an electromagnet; the sheer brutality of the film, which feels like it might be the most violent Godzilla film to this point though I honestly don't know how one would go about quantifying that kind of thing. There's a lot of blood, and for all that it's a bit gaudy and over-the-top - the gushing arterial spray from Godzilla's neck in one scene is comically Grand Guignol - it's nevertheless startling to see it in what had been so comfortably childish and simple to this point. And I have, naturally, put off the very best part of of all: Mechagodzilla. This is, simply put, one of the finest kaiju of all time, easily the best invented by Toho since the introduction of King Ghidorah, and the last wholly new creation that I truly adore out of all the films and decades to follow. It's sleek and pulpy in the very best tradition of pop sci-fi adventure, a bright silver beast that looks, honestly, nothing like a machine that anyone would build, but as the illustration for a comic book cover? Ideal. The details and tiny dashes of color are enough to make it terrifically appealling, and its arsenal is the very best sort of matinee fantasy nonsense. 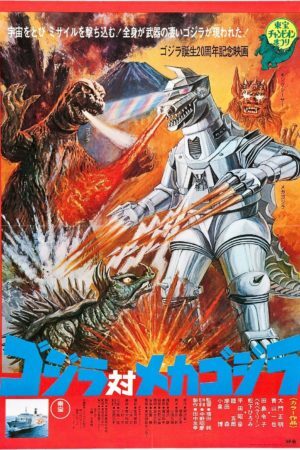 I could watch Mechagodzilla for hours and hours, shrieking and spitting lasers and firing its finger-missiles; repetition is bad and all, but the fact that it returned for a second go-round just a year later seems to me like the very best decision Toho could have made. This is the kind of playful, glossy, sharp design that gives pulp genre fiction a good name.